Please join the Fordham Intellectual Property, Media & Entertainment Law Journal and the Fordham Media & Entertainment Law Society in a book discussion on Monday, October 19, 2015 12:30 PM in Room 4-08 at Fordham University School of Law. The Beatles, the most popular, influential, and important band of all time, have been the subject of countless books of biography, photography, analysis, history, and conjecture. But this long and winding road has produced nothing like Baby You’re a Rich Man, the first book devoted to the cascade of legal actions engulfing the band, from the earliest days of the loveable mop-heads to their present prickly twilight of cultural sainthood. 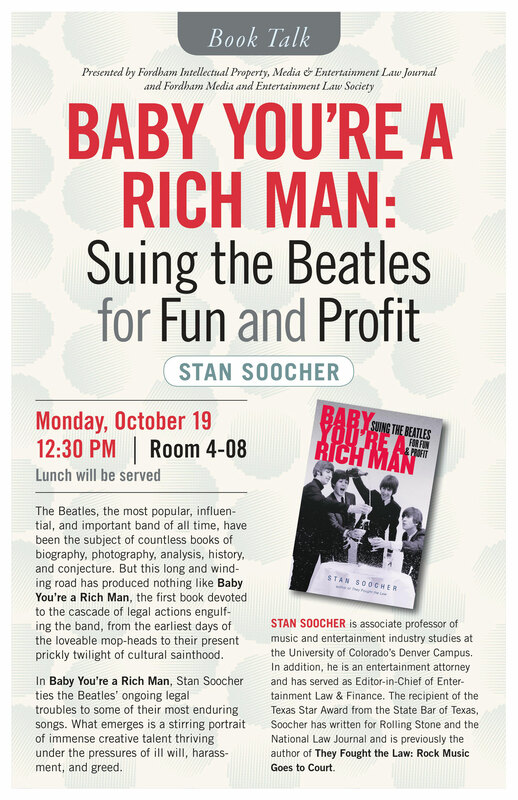 In Baby You’re a Rich Man, Stan Soocher ties the Beatles’ ongoing legal troubles to some of their most enduring songs. What emerges is a stirring portrait of immense creative talent thriving under the pressures of ill will, harassment, and greed. Author STAN SOOCHER is associate professor of music and entertainment industry studies at the University of Colorado’s Denver Campus. In addition, he is an entertainment attorney and has served as Editor-in-Chief of Entertainment Law & Finance. The recipient of the Texas Star Award from the State Bar of Texas, Soocher has written for Rolling Stone and the National Law Journal and is previously the author of They Fought the Law: Rock Music Goes to Court.